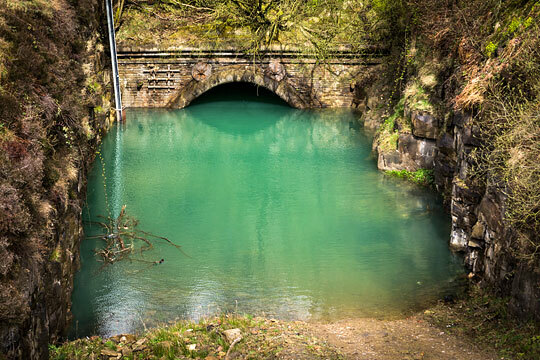 Lost within the undulations of Britain’s varied landscape are upwards of 600 railway tunnels which were stripped of their operational status as circumstances changed. Some of these have great scale and a compelling story to tell. By default, redundant tunnels tend to be looked upon as burdens. However, over recent years, around 60 have been rehabilitated as conduits for cycle paths - a role which fits very comfortably with today’s health and environmental responsibilities. More than 100 are owned by the Department for Transport (DfT) and looked after on its behalf by the Historical Railways Estate (HRE), part of Highways England. 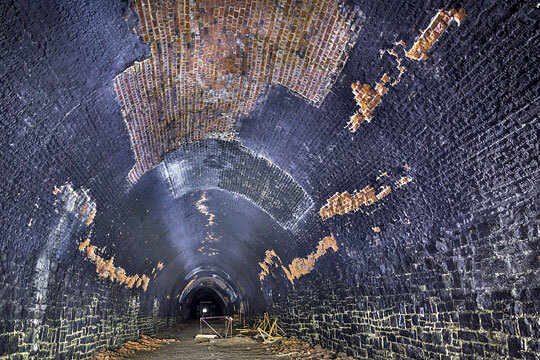 Queensbury Tunnel in West Yorkshire sits amongst that collection and presents the highest risk profile. Driven by the Great Northern Railway in the mid 1870s, the tunnel was explored by a newspaper reporter a few months ahead of its opening. He asserted that “the pyramids of Egypt sink into insignificance compared with such a work”. 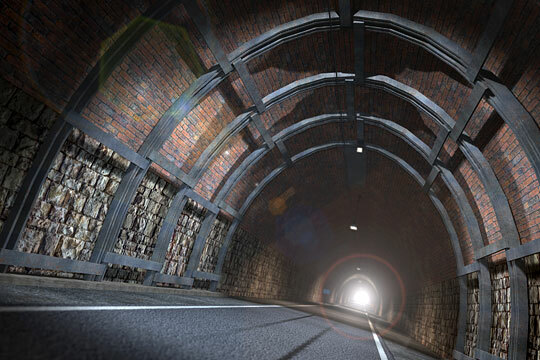 A visualisation of the tunnel as a cycle path. Hyperbole aside, the tunnel was a substantial feat by any measure. At 2,501 yards, it was the 11th longest on the railway network when traffic first passed through it and the difficulties imposed by the overwhelming influx of water caused the construction programme to overrun by two years. Use was made of an early rock drill, helping to justify its designation as a Historic Engineering Work by the Institution of Civil Engineers. Excavated through millstone grit, the tunnel’s southern approach cutting was itself an undertaking of considerable proportions, extending for more than 1,000 yards and reaching a depth of 60 feet. Post closure, this would prove a convenient dumping ground for Calderdale’s waste materials, Halifax Corporation acquiring it for that purpose in 1967. The district engineer insisted that a ramp must be created so vehicles could enter the tunnel if needs must, but he neglected to stipulate that drainage had to be maintained. Tipping started in the seventies and it wasn’t long before floodwaters at the portal reached almost to the crown, a function of the tunnel’s 1:100 falling gradient and high levels of water ingress. In 2009, British Railways Board (Residuary), HRE’s predecessor, commissioned its consulting engineers to undertake a feasibility study into future asset management options. 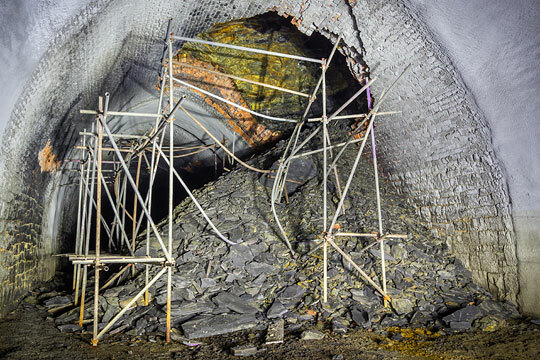 It recommended abandonment of the tunnel at a cost of £5.1 million, infilling 150 metres at both ends, together with seven ventilation/construction shafts. 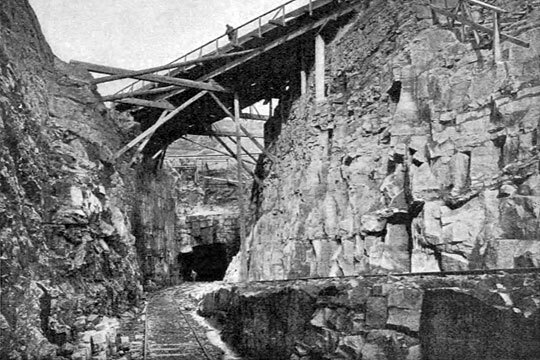 The tunnel's south portal and approach cutting, captured during construction in the 1870s. To fund this work, damages were sought from a developer who, in 2002, had acquired the cutting and adjacent land with the intention of building industrial units on it. The action failed - being speculative and misguided - and, going forward, proved costly in more than just a financial sense. Queensbury Tunnel kept the legal profession busy for four years, a settlement being finalised in 2015. To the developer’s benefit, a covenant was lifted that prevented any infilling immediately in front of the portal, whilst HRE secured a lease - the annual rent being £50 - allowing it to install pumps for dewatering purposes. These arrangements opened a ten-year window in which a long-term solution could be engineered to address risks presented by the tunnel, not least to the 70 dwellings built on or close to its centreline. The condition of the lining is locally poor, generally at locations where adjacent coal was mined in times past. To the south of No.4 shaft, compressive stress is causing the brick faces to blow in longitudinal strips at the haunches and crown, whilst two small partial collapses occurred in 2013-14 where patches of the brickwork’s inner ring were missing. Towards the north end, eccentric loading is causing a flattening of the arch on one side and associated pushing-up of the crown. The larger of the two partial collapses. In HRE’s view, “There is a risk, which grows daily, that one of the two known areas of collapse could unravel the tunnel lining back to one of the shafts causing a risk to properties above those shafts.” Although that’s a plausible chain of events in the longer term, there is nothing to suggest any immediate likelihood of such a failure: the nearest shafts are currently in fair condition and no major defects are recorded beneath them. The distance from the northern collapse to No.4 shaft is almost 150 metres. This is, however, the stated explanation as to why abandonment is now being actively pursued. Perched 400 feet above the tunnel, Queensbury celebrated the 150th anniversary of its named village status in 2013, boosting interest in its heritage assets including the vast Black Dyke Mills complex - birthplace of the famous brass band - and the former railway. 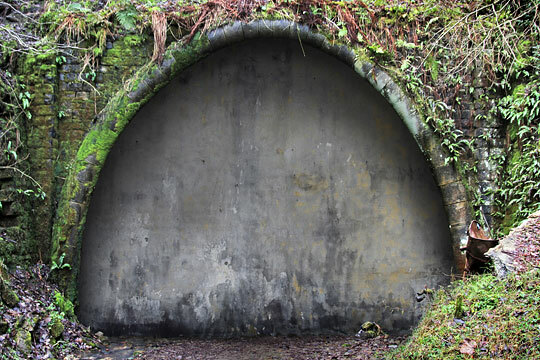 Awareness of the tunnel’s impending demise began to grow and a campaign group was started with the aim of preserving and eventually reopening it as a shared cycle/walkway. Not unreasonably, the group expressed the view that, if a large amount of taxpayers’ money was going to be invested in the tunnel, it should deliver some tangible benefit. Blown brickwork faces where the lining is being overloaded. But two key questions had to be addressed: how much would repair cost and who would take on its ownership, given that the proposition, if progressed, would cause friction with HRE’s terms of reference. The only logical recipient was Bradford Council - a body with bigger priorities, a squeezed budget and no regime in place to manage such a large and difficult structure. The task of establishing a repair cost was foisted on HRE by Robert Goodwill MP - at the time, Parliamentary Under-Secretary at the DfT - who was invited to visit the tunnel by the campaign group in June 2014. The work formed part of a new report by HRE’s consulting engineers, looking principally at options for abandonment. Some of the statements and conclusions in the draft version of this report were based on questionable evidence and hence wrong; this showed up in a couple of the costings. The preferred approach to abandonment involved backfilling the shafts but only 20 metres of tunnel at each end, the price tag being about £3 million. The repair proposal was developed through a high-level desk study, splitting the tunnel into four sections, with a generic form of remediation specified for each. Between Nos. 3 and 4 shafts, over a distance of 358 metres, the existing lining would be removed and replaced with precast concrete segments, for which a tunnelling shield would have to be procured. Much of the remainder would receive a sprayed concrete arch. Inevitably, with 80 per cent of the tunnel still in fair condition, such broad engineering brushes brought disproportionality. The plan to reline one section came with high levels of risk and suggested a perceived need to maintain structure gauge which, obviously, was not the case with an intended reuse for cycling. The repair cost put forward by the consultant was £35.4 million, including a 40 per cent contingency. Within HRE, although some expressed the view that this was “on the high side”, the draft report was not subjected to any formal review process - it was simply submitted for the Minister’s judgement. The southern approach cutting during a period of flood. HRE told the DfT that the costing offered “certainty to some degree” but that “the final estimate would only go upwards” as no provision had been made for a tarmac path, ventilation, lighting and so on. Actually these items were included - to the tune of £5.9 million - but, either way, the figure was sufficiently high for the Minister to rule out any prospect of repair. Bradford Council made it clear that it would not consider taking on a structure with such high levels of potential liabilities. Suddenly the campaign group’s goal became hopelessly distant. It’s at this point the story gets personal. For a couple of years, I had been helping the campaigners with back-room support - looking after their website, videos and the like. But I was then asked to consider whether an alternative approach might allow the tunnel to be repaired at a sustainable cost. There was no budget for this work; instead I had to rely on the generosity of the tunnelling fraternity, many members of which I’d met during my ten years writing for Rail Engineer magazine. Contributions came freely from a dozen or so specialists with deep collective expertise. 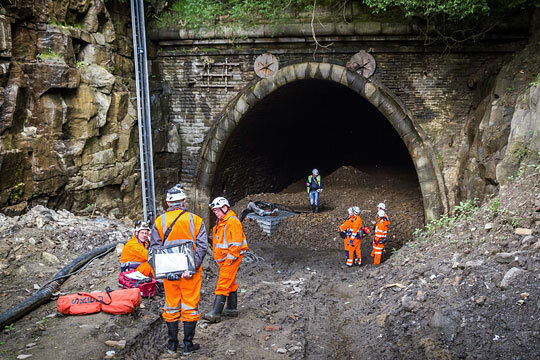 HRE facilitated a brief incursion into Queensbury Tunnel in the summer of 2016, led on the campaign group’s behalf by a respected engineer and representatives from a contractor with experience of refurbishing collapsed tunnels. Our time inside was spent validating and adding to a pre-existing plan of the defects, but we were not allowed into the 125-metre section between the two partial collapses. The same view taken during the Society's site visit in June 2016. A pragmatic scheme was developed which specified a form of remediation for each recorded defect, adopting Network Rail Standard repairs where appropriate. The contractor put together a price and 44-week programme for the core civil engineering works, allowing an overall cost of £2.8 million to be established. It would have been about £0.5 million higher had the now-sharper picture of the tunnel’s condition been available to us at the time, but the prevailing circumstances imposed difficult constraints. A sum of £1.5 million was subsequently added for the cycle path and lighting, to allow a like-for-like evaluation against HRE’s cost. The campaign group’s report - launched under the banner of the newly constituted Queensbury Tunnel Society (QTS) - fulfilled its remit, although it was weak in some areas and could reasonably be characterised as ‘cobbled together’. As we prepared for publication, I suggested to HRE that we met to discuss our report’s findings and implications. Their response could be summed up with two fingers, thus setting the tone for the two parties’ subsequent relationship. The QTS report was despatched to the DfT in October 2016 with a plea from the Society’s leader “to prevent the destruction of this valuable asset and to ensure the money [earmarked for abandonment] is invested for public good.” No response was forthcoming, although the DfT did commission its engineering advisors to compare the report with the one produced by HRE, with whom the advisors had an exchange of emails. QTS was not contacted, as a result of which a number of errant and occasionally patronising assumptions were made. This latest report found that HRE’s repair cost was “simply too high to be credible” and reflected an approach that was “perhaps too risk averse”. An allegation was made that the Society’s figure was “tailored to suit the previously published...cost of abandonment”, which was absolutely not the case. The large influx of water from No.2 shaft. Great emphasis was placed on the landownership issues at the south end of the tunnel - it was even stated that “engineering matters are...of secondary importance.” However, this unlikely observation was the function of a skewed viewpoint, not robust evidence. There could be no justification for reopening the tunnel without a solid social and economic foundation. 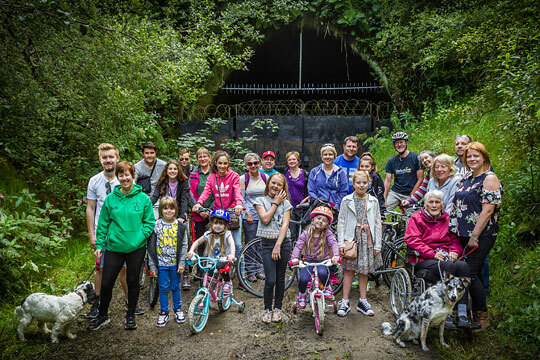 To this end, Sustrans was asked to carry out a study - funded by HRE, alongside Bradford and Calderdale councils - into the likely health, environmental, transport and tourism impacts of a cycle network with Queensbury Tunnel as its centrepiece. A number of options were evaluated, with the most ambitious - linking Halifax to Bradford and Keighley - forecast to deliver a £37.6 million uplift over 30 years. The Benefit Cost Ratio (BCR) would depend, in part, on the tunnel’s repair cost; it exceeded 3:1 using the QTS figure. Even a realistic ‘worst case’ cost would deliver better than 2:1, still representing high value for money. This report, along with that of the Queensbury Tunnel Society, dispersed the dark clouds sufficiently for Bradford Council to renew its interest in the proposal to reopen the tunnel. It recognises the potential benefits to the district and is working hard towards a positive conclusion. The north portal's likely appearance after abandonment. Funding has been secured from HRE for an independent programme of intrusive investigations, with their cost to be deducted from a dowry which would accompany any subsequent transfer of ownership. The level of this dowry is likely to match the sum allocated to abandonment - about £3 million. Based upon the investigations, the Council will make a final decision on the viability of taking on the tunnel. There are no cheap or easy solutions when it comes to Queensbury Tunnel, whichever way things go. But HRE’s failure to ever pay rent on the approach cutting - resulting in the recent termination of its lease - was a baffling, self-inflicted wound which inevitably brings more cost and difficulty. Given its previous misjudgements and their lasting negative impact, surely serious questions should now be asked of HRE. Indeed they have. In May, the Council was asked for a Screening Opinion on the need for an Environmental Impact Assessment. Evidence was offered on air quality, noise, ecology and heritage, but not one word on the risk of ground settlement. The outcome is still awaited. And what of the uncomfortable contradiction within the Department for Transport whereby one part of it invests enthusiastically in the development of new cycling infrastructure - because that’s the right thing to do - whilst another funds the self-destruction of a structure which could link the evolving cycle networks in Calderdale, Airedale and Bradford? Surely the socially responsible approach would be for the DfT to see beyond its own narrow interests and work in partnership with Bradford Council, driving the proposal forward until an outcome emerges that everyone can buy into. A diverse collection of campaign supporters gathered at the north portal. 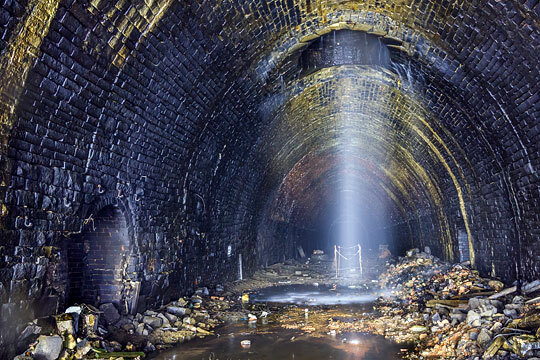 Yes, this is just a grotty old tunnel: it’s hard to get excited about it if you only see in three dimensions. But times are changing and our outlook has to reflect that. The possible abandonment of Queensbury Tunnel says much about our strategic vision and commitment to sustainable forms of transport. In that context, the tunnel is an opportunity. The culture needs to evolve from one focused sharply on risk aversion into something more positive, enlightened and holistic.